Your tree swing hanging kit has been upgraded with many advanced safety features and is constructed from several of the most durable materials on earth - all this while remaining affordable & fun! We cut no corners in our products and will cut no corners in our support to you. You'll love the DCAL DIFFERENCE! Beautiful black poly fiber straps will look great in your backyard! Reinforced stitching for improved strength over the competition. 2-inch-wide tree straps specially designed to avoid damage to the beautiful trees in your lawn or at the park (when installed as per the instructions). Weather, heat, corrosion, & chemical resistant. 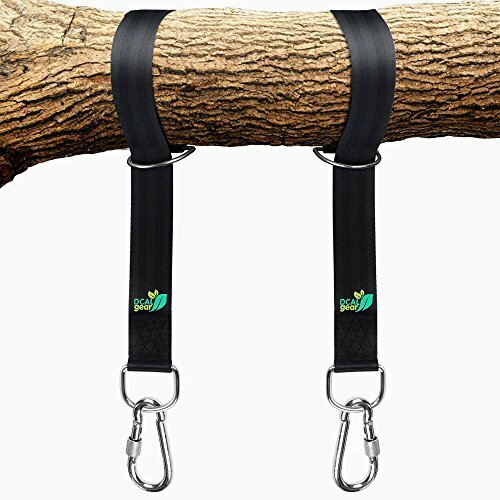 All metal is heavy-duty 304 stainless steel - your hammock tree strap hardware will not rust! Large carabiner and D-ring combination provides much more stability than S hooks and makes your elite strap system nearly indestructible. Compatible with your favorite brand-name hammocks and outdoor baby swings (ENO, Grand Trunk, Little Tikes, Step2, etc.). We expect the best for our family and want the same for yours. The confidence we have in our premiere outdoor swing strap set will give your children a smooth ride, ensuring their safety and guaranteeing their fun with every swing! What do you have to lose? Order today & get swinging! If you have any questions about this product by DCAL Gear, contact us by completing and submitting the form below. If you are looking for a specif part number, please include it with your message.